Diving – close up, originally uploaded by whiteafrican. Coming back from the Web 2.0 Expo, I happened to be seated with a number of the Humboldt State University rugby team. They mentioned that the US Division II rugby playoffs were taking place this weekend at a facility near Orlando, Florida. Realizing that I didn’t want to see a computer, blog, check email or think about the web at all, I set off for the pitch with to try out my new camera in a real “sports” setting. 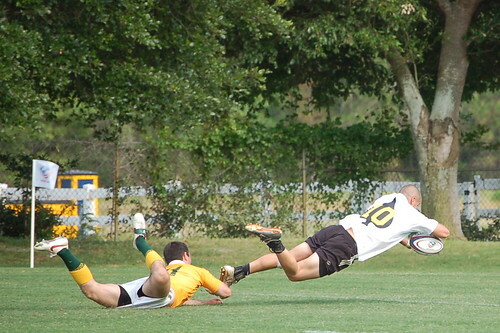 The image above, of a guy diving to tackle as the other dives for the try, is my absolute favorite of the whole day. I took about 1400 pictures in the space of 3 hours and came out with 250 decent pictures. Of those, only 50 would I consider “good”. Thats pretty cool photo’s man, and pretty funny too. I played against those humboldt state guyos when I was at chico; and just noticed that jason maxwell (from the dominant 1985 – 1987 teams at rva) was residing in chico now too…that is off topic though. good stuff with the camera, very crisp clean and well timed! My boys, Middlebury, are going to win it this year. That’s our legacy. In a way, it’s a legacy of Strath and Saints. Big up Middlebury Rugby. Actually, I met one of the guys from Middlebury who used to play for Srath. Jimmy – plays flanker, and a very good one too. Got some shots of him jumping in the lineouts. Oh yeah. Jimmy’s my cousin. Great kid. Excellent flanker .. and an asset in any lineout. Good pictures, mate! Do you know if there’s a way to get full quality pics from some of those you have on the site, so they can be turned into hardcopies? Jimmy would like a couple nice ones you took. Kiwete, you can just click on “all sizes” to download the pictures at a much larger size. If you “friend” me on Flickr, you’ll be able to just order any pictures you want and pick them up at Target in an hour. They’re good quality, and it’s super easy.